DESCRIPTION -- As used on board dining spoon from the Rotterdam Lloyd shipping company which is in a very good condition and shows on it the company flag (click on the picture to see a closer view of the company flag ). HISTORY -- The company started life in 1839 as Willem Ruys, using sailing ships to trade with the Dutch East Indies and Far East. The company underwent a number of name changes: to Stoomboot Reederij "Rotterdamsche Lloyd" (Rotterdam Lloyd) in 1875, Stoomvaart Maatschappij Rotterdamsche Lloyd (Rotterdam Steam Navigation Co) in 1881 and in 1883 to N.V. Rotterdamsche Lloyd. DESCRIPTION -- Rare find of original dessert spoon from the Moss Hutchinson Line which is nicely top marked with the belt logo, which reads across it MOSS HUTCHINSON LINE and also has the company houseflag on. It is in a superb condition and a genuine as used on board piece (Price is for ONE spoon only and not the TWO in the picture). HISTORY -- The company was founded in 1815 by Mr. James Moss, a Liverpool ship chandler, who wanted to charter a sailing vessel to trade in the Mediterranean ports. In 1823, he was joined in partnership by Mr. Thomas Hampson, and the company became known as Moss & Hampson. After its dissolution in 1833, it continued its business under the name of James Moss & Co., with Messrs. William Moss and Richard Spencer as the new partners. 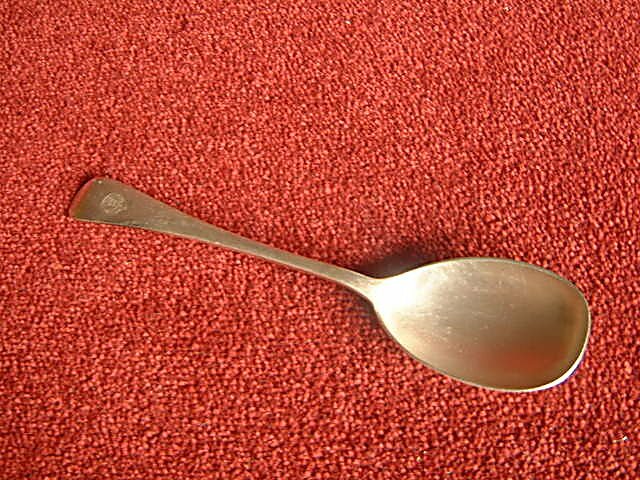 DESCRIPTION -- Original silver-plated soup spoon from the Atlantic Transport Line Shipping Company which is an early piece and shows the company belt and name on the handle and the size is 7" (19cm) long. HISTORY -- The Atlantic Transport Line was a Baltimore, Maryland-based passenger shipping line that was folded into the International Mercantile Marine shipping trust (IMM) in 1901. The line developed with railroad support as an offshoot of Bernard N. Baker's Baltimore Storage and Lighterage Company in 1881. Although American owned, the Atlantic Transport Line operated out of Britain, with British registered and manned vessels, most of which were British built. General cargo, live cattle, and small numbers of passengers were carried to British ports and the line developed an excellent reputation for shipping valuable horses. DESCRIPTION -- Superb old dinner 'serving spoon' from the Mogul Steamship Company with the name on the belt logo at the end of the spoon together with the 'Houseflag'. It is very rare indeed to find items from this old Victorian shipping company, which is in a great condition considering its age.